Vil.la Urània is a new architectural oddity in Barcelona. 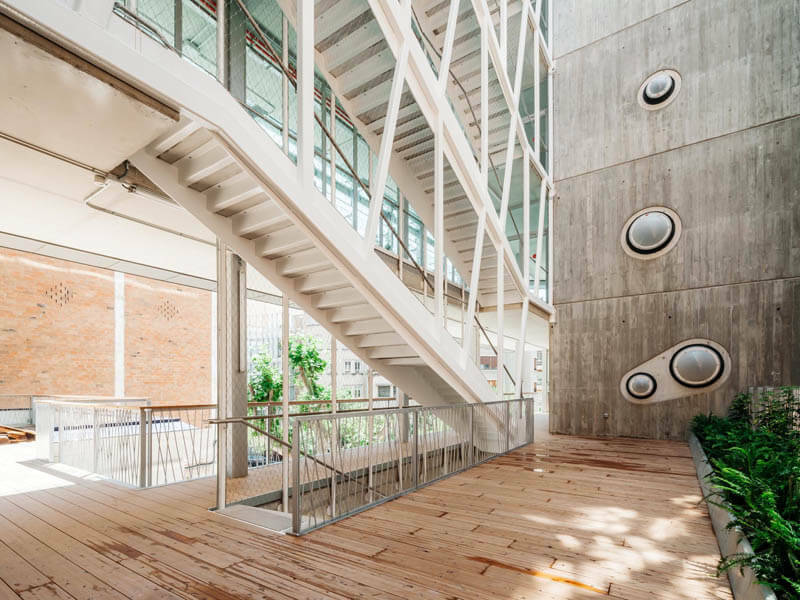 This complex of buildings located between Barcelona’s Via Agusta and C/ Saragossa occupying the site of Vil.la Urània comprises a socio-cultural amenity for neighbouring residents. 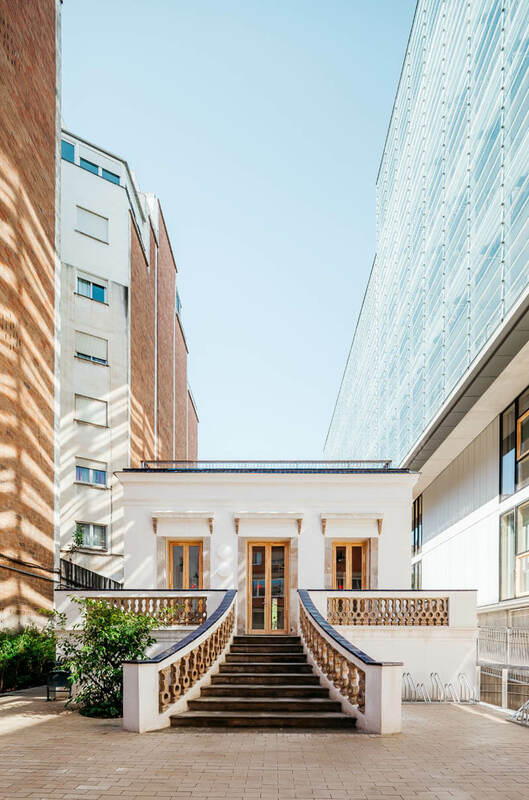 The slightly surreal resolution of the Vil.la Urània project designed by SUMO Arquitectes and Yolanda Olmo combines a new build construction with the refurbishment of the existing 19th C villa and gardens on the site, the former home of scientist Josep Comas i Solà who discovered 945 Barcelona, a minor planet or asteroid orbiting the sun named after his native city. 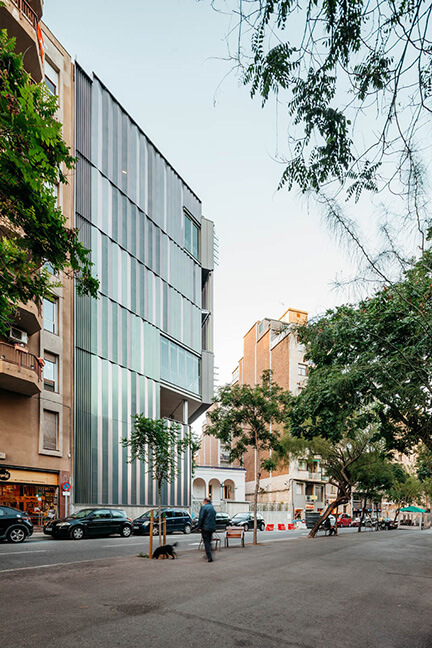 The immediate context (with adjacent buildings between 7 and 8 storeys tall) creates a chasm which reflects the urban changes that have occurred within the Sarrià-Sant Gervasi neighbourhood, once the outer suburbs of Barcelona and defined by gardens and villas. Vil.la Urània came close to being demolished in 2012 but local residents and descendants of Comas joined forces to ensure that the property ( which was donated by the scientist to the city) would survive and be put to a communal use. The new building consists of 3,200 sq.m. and was designed by the architects as an NZEB (nearly zero energy building) employing a combination of both low and high-tech elements, such as the 20,000 litre underground rainwater tank used to irrigate the planting, hemp insulation and materials that can be recycled. The new-build extension is conceived as a tall, narrow building. Its main façade, facing South-East, is organised around an intermediate gallery zone that is clad with an adaptable skin that can be either more or less porous depending on external conditions. This passive temperature controlled area is one of encounter and informal activities as well as the circulation within the building. This intermediate space works like a greenhouse in winter and as an umbraculum in summer, acting as a thermal lobby separating the heated zones from the outside, reducing the overall energy consumption. The facade incorporates automatic responses to external conditions. Indoor temperature sensors act on the glass facade, opening it completely when necessary. Similarly external sensors measure the solar radiation activating the retractable blinds in summer. The interior planting including different species provides a natural and fresh environment during the summer, while in winter the falling leaves allow for greater solar gain. The building envelope has been designed to achieve high levels of insulation and air tightness. The building’s overall energy consumption is therefore very low and much of it is generated by the building itself. A geothermal heat pump system supplied by 11 excavated wells scattered throughout the plot provides heating, cooling and hot water. Photovoltaic panels located on the roof supply part of the building’s total electrical consumption. 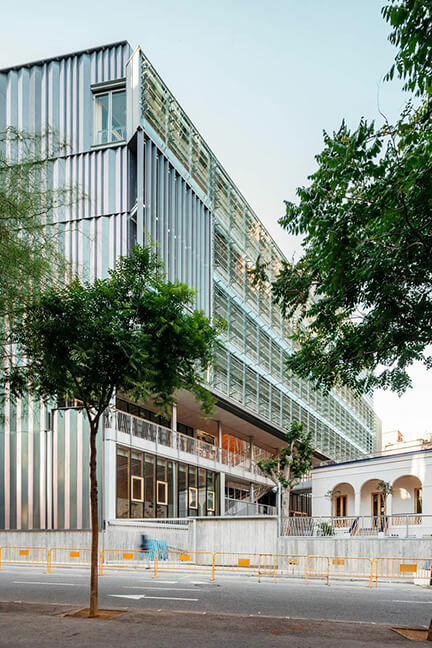 Vil.la Urània was awarded an A energy certificate and gold LEED certificate prior to construction based on its design with and a silver LEED certification pending for the finished building. You can see Vil.la Urània and other buildings on our Off-the-Grid tour, which takes you out of the tourist zone to some of Barcelona’s lesser-known architectural works.